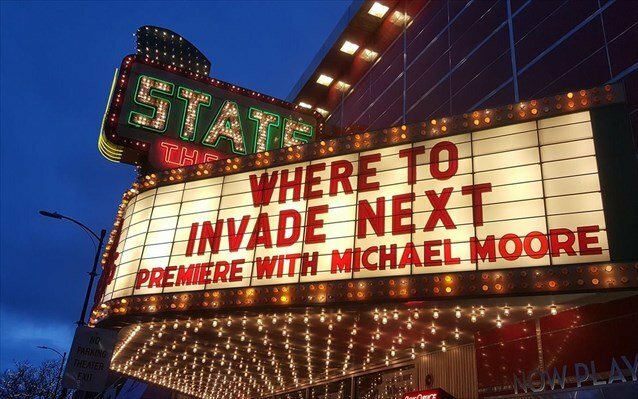 In Where To Invade Next Michael Moore has made an entire film about U.S. exceptionalism -- without ever using that word. The deadly results of patriarchy are examined in excruciating detail, and feminist values are applauded and extolled -- without ever using those words either. Moore looks at what allowing patriarchy to occupy the narrative has wrought and explicitly says nothing about that particular problem; he simply reoccupies the narrative, brilliantly, to let us in on the news that everything we think is an intractable problem could, in fact, vanish rapidly. If only we believe, and then pick up a hammer and chisel and start breaking it down. This film may well be Moore's magnum opus. It combines elements of his trademark faux naif style of investigative reporting, his fascination with industry (Roger & Me), his analysis of the roots of U.S. aggression (Bowling for Columbine), his thesis that government on behalf of greed is killing us (Capitalism: A Love Story) and that if other wealthy nations can afford necessities like universal health care (Sicko), then we can, too. Moore nods at the Pentagon budget in passing at the start of the film but he never returns to this starting point to explain some of the mysterious budget shortfalls that prevent U.S. citizens from enjoying the same quality of life as Europeans. Didactic is not his style. He'd rather make us laugh at the foolishness of a photograph of the joint chiefs of staff holding their hands over their crotches or what Moore calls (for a big laugh from the audience I saw the film with) their "no fly zones." This is after he has thrown down the biggest gauntlet of all in the culture of vicious patriarchs, taunting the Pentagon brass as failures for losing every war since "the big one." This is the platform from which to launch the organizing idea of the film: an overweight, undergroomed American will go forth bearing our flag and invade other nations to see what we can take that the U.S. needs. I'm making the movie sound a lot more funny than it actually was. Not much of what Moore shared about the state we're in or how those on the other side of the pond live was news to me, but it felt tragic. The archival footage of police violence against Black people was not new but was still just as horrifying, as intended. 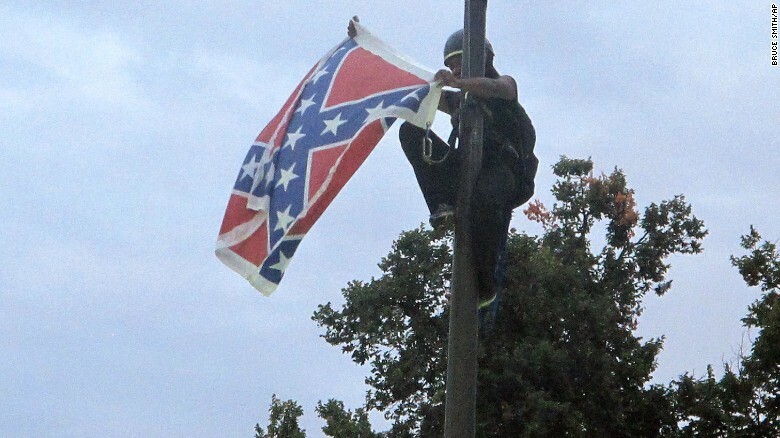 Coupled with multiple images of incarcerated Black men it was enough to make me weep. Slavery isn't over, and Moore points out the obscene profits produced by prisoner labor. He even names a few brand names you might be wearing as products of this labor arrangement. There's an implied comparison with the Italian clothing manufacturer whose employees enjoy benefits and vacations beyond the wildest dreams of hourly workers in the U.S.
Moore also points out that it's not likely a coincidence that mass incarceration of Black men in the "war on drugs" coincided with the assassination of Black leaders and the rise of Black empowerment at the end of the civil rights ferment of the 1960's. But the wisest nugget in a very wise film turns out to be about Holocaust denial: how the Germans don't do it, and so they heal. The dearth of teaching about the truth of genocide against the Native people of the Americas is a reason why the U.S. can't heal itself from the violence that continues to plague it. Also, though Moore doesn't point this out, it's the foundation for this genocide to be ongoing in the pollution of the last few scraps of Native territory by uranium mining, fracking, pipeline construction and dioxin, and in disproportionate violence against Native women and girls. In light of the really heavy stuff you may be surprised to hear that a tragedy that left the audience in Waterville, Maine yesterday in stunned silence was: school lunches. French children horrified at the images of U.S. school lunch. What even is that? indeed. Seldom has there been a more vivid depiction of patriarchy's lack of care for the young than the U.S. school lunch. Spoiler alert: the opening scenes of chefs at work preparing fresh local food turn out to be set in a school kitchen in the French Alps. Because one of the film crew told her daughter they were filming there, the stateside student began sending her mother a photo of the lunch at her school each day. Placing these photos side by side is the picture worth a thousand words about the dismal state of nutrition, childcare, and public education in the U.S. today. Moore thinks he can explain all this: women are fully involved in making the decisions that result in bankers being jailed for crashing their economy (Iceland), children eating exquisitely prepared vegetables (France), employees going home for a two hour home-cooked midday meal with their families every day (Italy), and women being able to participate in a government that represents its people (Tunisia). Oh, and did I mention free university education for all comers including U.S. students who emigrated because they couldn't afford even community college (Slovenia)? This is far from a complete list of the ideas Moore came to steal. Treatment of criminals (Norway) and the re-design of early public education to a model that actually works (Finland) plus women's reproductive health care for free (Tunisia) are also covered. Critics will find much missing from Where To Invade Next: treatment of immigrants in the featured countries is glossed over, plus the Eurocentric bias of the entire project will likely come up. As my husband observed, the film is a sea of white faces. Moore doesn't explain why Japan or Nigeria didn't make it onto his radar as countries where English is widely spoken and ideas that are working are worth stealing. I suspect he went to countries where the heads of companies or governmental officials would agree to be in his film. It was fun to hear more from Pasi Sahlberg, a former official of the Ministry of Education and Culture in Finland, as I had found much to think about after seeing his presentation last March at an education conference in Washington DC. No homework, fewer hours in school, fewer standardized tests, and rigorous teacher preparation is the Finnish prescription for what ails U.S. public education. Currently they're #1 and we're #29. Moore offers a little salve to our wounded pride by pointing out late in the film that most of the ideas being realized so brilliantly elsewhere have roots in the U.S. He includes testimony from several Europeans to this effect. But it's Amel Smaoui, a journalist in Tunisia, who diagnoses the underlying disease. Looking directly into the camera for a moment, she urges us to be curious about the rest of the world. She tells Moore's audience that they invented one of the best things in the world: the Internet. She prescribes using it to find out about other cultures, to inquire about and learn from them. No need to invade after all. I couldn't wait to see this film, now I really can't wait! Thanks, Lisa. Take care. Thanks, Patsy. It's at Railroad Square Cinema in Waterville all week, with matinees for those of us who can't stay awake through a late movie anymore.